After coming back from London last November, Cowboys Chief Operating Officer Stephen Jones told 105.3 The Fan [KRLD-FM] it was his family’s fault quarterback Tony Romo had so little postseason success. In the advent of a new season that kicks off Sept. 13 against the New York Giants at AT&T Stadium, owner Jerry Jones said on the same airwaves he doesn’t want the ongoing debate over Romo’s postseason resume to rest. "I am skeptical when we say ‘puts to rest’ or — I’m not so sure I want to put it to rest from a personal standpoint," said Jones. "It’s the discussion. It’s the debate. It’s the using a great season or a great game to gauge and talk about players as they relate to each other or they relate to other games they played. Let’s don’t put it to rest." 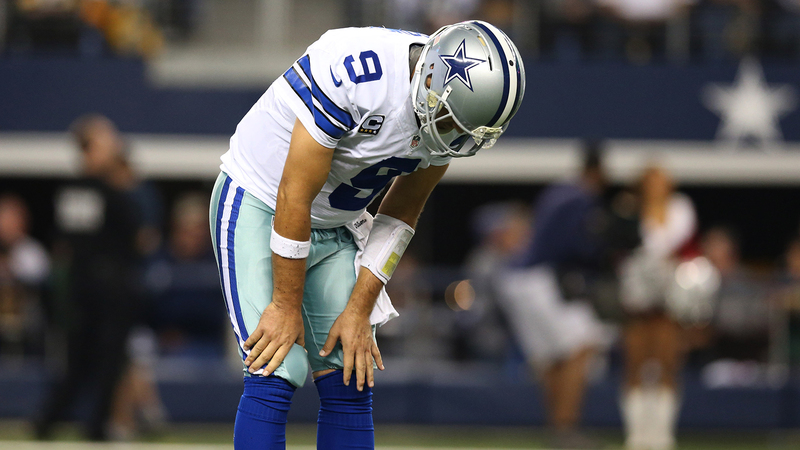 Romo is 2-4 in the playoffs with four postseason appearances in his previous 13 seasons. At age 35 and having undergone back surgeries in two of the past three offseasons, time is running out. However, Romo is captaining one of the youngest teams in the game with a concentration of youth along the offensive line, thus buying the once undrafted passer out of Eastern Illinois more time. The intent behind Jones’ comments is clear: He doesn’t want the discussion over his franchise quarterback to end because he wants Romo to keep adding to his legacy. "Let’s keep it alive," Jones said. "Let’s keep discussing it. Let’s let him go out there and try to do something bigger here Opening Night than he’s done before. All of this is what I’m for that is our eyeing interest on the game of football." Despite earning a reputation as a big-game choker and turnover factory, Romo has been quite the contrary since 2011. His 36 wins are tied with Seattle’s Russell Wilson for ninth-best, his 66.2 percent-completion percentage is fourth behind Drew Brees, Peyton Manning and Aaron Rodgers, and Romo’s 48 interceptions are the third-fewest behind Tom Brady and Ben Roethlisberger among passers with at least 2,000 attempts. In the past five seasons, the lack of a running game and a porous defense has been more detrimental to Dallas’ success. Jones doesn’t let the entire "Romo Debate" influence his evaluation of the four-time Pro Bowler. "I think the quarterback is such a high-level of critique and our expectations are so much for him to, for the player, or for the position, to, if you will, play above himself," said Jones. "We complain if he’s not playing above himself. We complain at the level his contribution is to the team or how much he should be involved or how much he shouldn’t be involved. But I think we make it what it is. There’s no question it’s hard to win without having some excellence some place in the quarterback position." What continues to impress Jones, who is entering his 27th year of ownership of the club, about Romo is his studiousness towards, not only football, but competition itself. "He’s a student of the game. He’s a student, if you will, of competition. He has always analyzed every aspect of his game. I always thought early on the story of him throwing the ball into his couch thousands of times, just a little ol’ eight-foot throw into his living room thousands of times. And you can just hear him in there fantasizing and creating situations and throwing the ball. And listen to him talk about getting over a putt and analyzing that putt as it might relate to something competitive in a game. "Now, he’s been doing that. He’s good at it. His coaches just can’t say enough about how exceptional he is with experience they’ve had with players. We’re going to benefit from this."